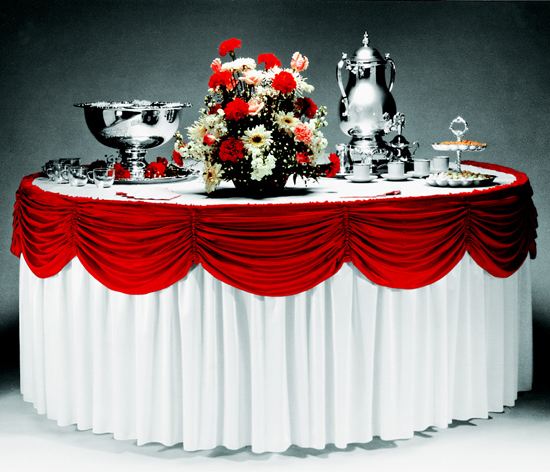 Great for Banquets, Catering, Buffet Lines, Weddings, Registration Tables, Meetings, Conferences, Seminars, etc. 30" Round Table Size = Skirt Size: 8'6"
42" Round Table Size = Skirt Size: 11'6"
66" Round Table Size = Skirt Size: 17'6"
"A" or "AV" Clip: Fits Table Edge 3/8" to 1/2"
"C" or "CV" Clip: Fits Table Edge 1"
"D" or "DV" Clip: Fits Table Edge 1-1/8" to 1-1/2"
"T" or "TV" Clip: Fits Table Edge 5/8"
If Ordered Separately: Minimum Order 6 Each. Thereafter, No Case Pack.